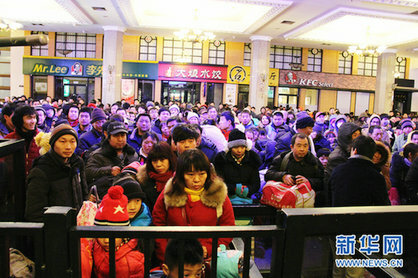 Spring Festival, the Lunar New Year, is the most important traditional Chinese holiday. This year it falls on February 8th, and Chinese are rushing to get home to welcome the Year of the Monkey with their families on the eve of the festival. The world's biggest annual human migration starts today. And as a cold front said to be the worst in decades sweeps across the country, China's transport system has geared up to cope with it. In the next forty days, passenger journeys nationwide will top 2.9 billion, up 3.6 percent year on year. On the first day alone, six million railway journeys are expected. The railways are bracing for more pressure than other means of transport, as extreme cold is making some travelers wary of planes and highways. Still, passenger journeys made via road are predicted to reach 2.5 billion, up 2.4 percent, and air, 54 million, up 11 percent. For journeys by water, 42 million.